President Shimon Peres has said he supports President Obama's decision to seek Congressional approval for military action against Syria. President Shimon Peres has said he supports U.S. President Barack Obama's decision to seek Congressional approval for military action against Syria. 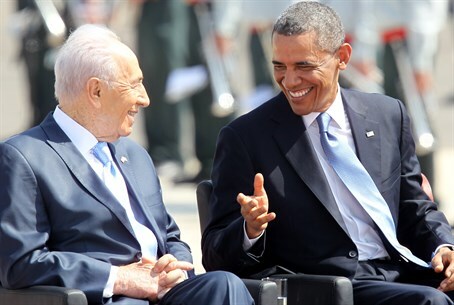 "I have full faith in President Obama's moral and operational stance," Peres said in an interview on Monday with army radio. He added: "I recommend patience, I am confident that the United States will respond in the right way to Syria." Obama said Saturday he would ask the U.S. Congress to authorize military action against Syria over an alleged chemical attack, lifting the threat of immediate strikes on President Bashar al-Assad's regime. Peres said the situation in Syria was now more complicated than ever, requiring careful deliberation over foreign intervention. "There is no one Syria anymore. Syria as it was is no longer. Assad cannot unite Syria, there are three or four countries in one," he said, in apparent reference to various rebel groups fighting to topple the regime. "It is not for Israel to decide on Syria, we are in a unique position, for varying reasons there is consensus against Israeli involvement. We did not create the Syrian situation," he said. Obama surprised many with his decision Saturday to ask for the OK of lawmakers for any military intervention in Syria. In stark contrast to the support offered by President Peres, other politicians in Israel have slammed the U.S. president accusing him of hesitation and hyprocrisy that would serve to strengthen the regimes in Syria and Iran. Despite the vote yet to take place at Congress, the perceived indecision of President Obama was strengthened today as the aircraft carrier U.S.S. Nimitz moved into the Red Sea in preparation for a possible strike.